When planning your event it is important to choose the right parts to make it a success. Chairs are one of those important factors that can make or break your event. Choosing the right chair rental is important, and that is why The Party Place is here to help you choose the right chair for your event. Weather your planning a wedding, a corporate event or a simple birthday party, We have the perfect chair for your event. 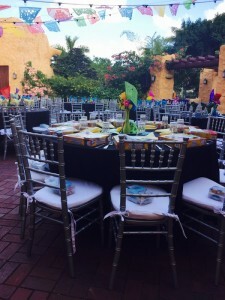 We have the best deals on Chiavari Chair Rental Miami has to offer. The Chiavari Chair is a good choice for any event, We have a variety of different materials and we have a variety of finishes. We have Gold, Silver, Bronze, Steel, Bamboo Chiavari Chairs and more. The Party Place is proud to provide quality Chiavari Chair Rentals in Miami, Fort Lauderdale, & West Palm Beach. The Chiavari Chair Rental includes cushions, these cushions are thick and designed specifically for the Chiavari Chair. Want different color cushions? We have it, We have different colors available. Samsonite Chair rentals are a good option to any Corporate event, or birthday party, We have many White Samsonite rentals available. We currently carry two of the best Samsonite rentals, We carry Wedding White Samsonite Chair, & White Fan Samsonite. Many options are available, We will be able to provide the best Chair rentals. Many of our patrons have rented these beautiful garden chairs for weddings. Our Garden Chair Rental are high quality and in perfect conditions. We have a wide variety of decorated options for the garden chair rental. Call us today and get a free quote on the garden chairs. We consider our selves the best Miami Party Rentals Company, and with that we guarantee our work and equipment will work for your Party or event. We are Licensed and Insured in for all events and currently hold Permits to serve in all Miami Dade and Broward County Parks. For more information about our services and what we can do for your upcoming event, Give us a call at (305) 718 9299, We will be Glad to help you with all your Party Rental Needs.